Most penny stocks for dummies publications strongly advise you to get a good stock broker who will help you separate grain from chaff and recommend you the best penny stocks to buy. Depending on how much money you decided to invest into penny stock companies will ultimately guide your decision of hiring a penny stock broker. If your investment portfolio is anywhere from a couple hundred to a thousand dollars, please take our word and don’t get a broker. Many penny stock brokers make a full time living out of helping customers do trades without carrying any financial responsibility for the losses and getting paid regardless. Different penny stock brokers utilize different commission and fee grids to help them get paid, including a flat fee per transaction, percentage from each share, annual inactivity fees and many more. In case your penny stock investment portfolio is rather small, penny stock brokers’ fees might negate considerable amounts of your earnings. Let’s take a look at some of successful penny stock brokers’ secrets they might not be telling you about. 1. No matter how convincing your penny stock broker might sound about incredible financial opportunities of a certain penny stock investment, keep it cool and stick to your Investment portfolio. Since penny stock market is highly volatile, do not put more than 10% of your entire portfolio into this type of market to avoid devastating losses. 2. Most penny stock brokers would like you to believe that they are absolutely necessary components of making money at a penny stock market. Unfortunately to them, there are lots of wonderful discount places to buy penny stocks online without having to pay exorbitant penny stock broker fees, especially if you are a small budget investor. Try discount online brokerage places like Ameritrade or Lowtrades with easy and foolproof ways to do penny stock trading on your own. 3. On average, penny stock brokers’ fees should not amount to more than 1% of a transaction cash value to make it a worthy financial move. 4. Do not use friends’, relatives’ or TV infomercials’ leads that describe amazing penny stock companies that you should be investing into. Even if the information is true, it’s probably too late to buy in. In most cases, penny stock companies that are surrounded by emotional hype are not sound investments. 5. Research which penny stocks to watch by reading online news reports, getting a subscription to a reputable penny stock publication. Once you spend some time researching certain penny stock companies, you will know which markers you should be looking for like, for example, new products, innovative technologies or new ownership that can drive up certain penny stock prices. 6. Knowing when to sell is perhaps the biggest secret of experienced penny stock brokers. 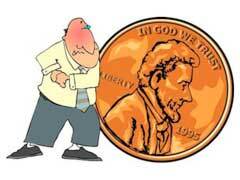 Penny stock trading is very much like gambling and knowing when to quit is important. 7. Keep yourself in the know of things about new market trends, developments and which particular market areas are experiencing growth spurts or recession streaks to help with penny stock selection. 8. Never go into additional financial debt to be able to withstand penny stock trading. If you have to cash in your 401K to buy additional stocks to make up for considerable losses, penny stock trading is not right for you. Set aside a firm penny stock trading limit that can not be overridden to ensure penny stock investing success. 9. Always have realistic expectations and expect losses as normal part of penny stock trading. 10. Beware of penny stock companies frauds and scams, especially with offers coming in the e-mail or TV infomercials. Stay away from penny stock trading with companies that offer no information or if you feel pressured to make a trade in a limited period of time.